Hollinger International has agreed to sell the Jerusalem Post and Jerusalem Report titles to Israeli publisher Mirkaei Tikshoret for $13.2m (£7.1m). The move is the second major disposal for Hollinger after the Telegraph group was sold earlier this year for 1.3bn. 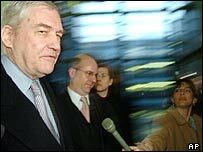 The firm's former chief executive, Lord Black, is alleged to have diverted $85m from the company between 1994 and 2003. Hollinger once controlled 60% of Canadian newspapers and owned papers in the US, UK, Australia and Israel. It is currently reviewing its assets following the resignation of Lord Black. Hollinger sold the UK-based Telegraph newspaper group earlier this year to billionaire brothers David and Frederick Barclay. Along with the Telegraph titles, the Jerusalem Post has been a centrepiece of the Hollinger empire since the firm offloaded its Canadian properties in 2002. The English-language Post - set up in 1932 - has lost money recently, but it is an influential newspaper in the Middle East. The deal is expected to close in mid-December. Tel-Aviv-based Mirkaei Tikshoret is to bring on board Canadian publisher CanWest Global Communications as a 50-50 partner. The Israeli group owns radio and television stations, and publications in Hebrew and Russian.